For hike 10 I joined a group of about 15 people for an educational hike of the Western Loop of the Yosemite Valley Floor trail. You can read more about my trip to Yosemite here, as well as check out my hike 8 and hike 9 which took place in the Valley as well. Let me just start by saying this program with Pete Devine was wonderful. Pete seems to be naturally curious, brilliant and a gifted communicator. I felt very privileged to have spent an afternoon in the Valley with him. 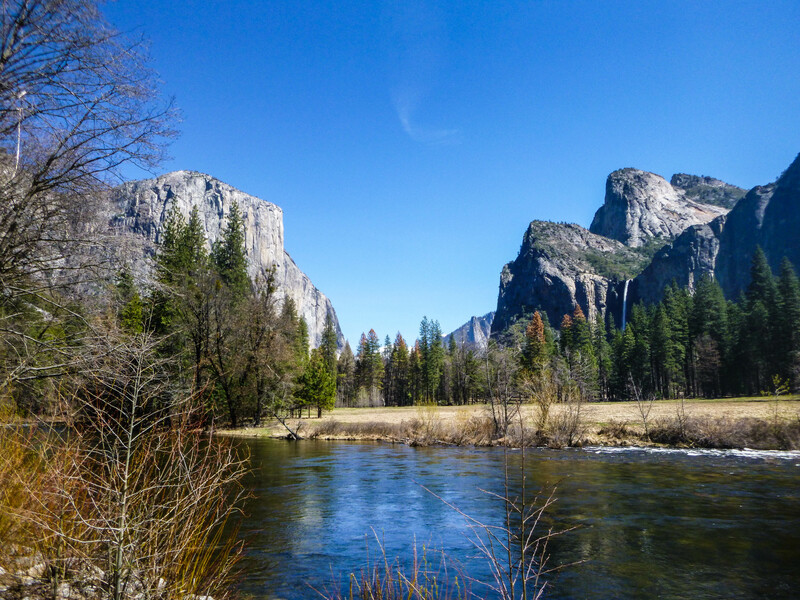 Our hike was a 6-ish mile loop, starting at El Capitan Bridge, hiking west on the north side of the Merced River, crossing the Merced at the Pohono Bridge and heading back to El Cap on the south side of the river. This hike was jam packed with both huge highlights that everyone looks for when they visit Yosemite as well as little-known stories and off-trail details. We started by spending quite a bit of time admiring El Cap and watching some so-tiny-they-were-barely-visible climbers. We also got to see Horsetail Fall which you may recognize by its other name when conditions are just right – the Firefall. The next showstopper was Ribbon Fall, the longest single drop waterfall in North America. As this fall is fed by snowmelt, in drought years the fall may not run. Luckily I visited in a year with almost average snowfall and the waterfall was magnificent. Along our way to the Pohono Bridge we stopped at an abandoned chimney and fireplace built and used by the CCC, and had a picnic around this weathered but beautiful hearth. Another stop yielded a hidden surprise: a “Bedrock Mortar” which is a small indentation in the rocky ground used by Miwok women to grind up grain. It was fascinating and I was happy that this course included this as well as quite a bit of other information about the Native Americans in this area and not just the white men who “discovered” Yosemite. Next up was Bridalveil Fall which was my favorite fall in the park. It’s not the biggest, but I loved feeling the power of this fall in the mist that hit us on the ground below. We traveled past Leaning Tower, the Cathedral Rocks and Cathedral Spires, with the Three Brothers and Half Dome always ahead. We learned all about the rocks we were climbing over including facts about talus, frazil ice and different types of moraines. I was disappointed we didn’t see any bears, but we did pass by a deer having her lunch. I’m sure I would have enjoyed my time in the park no matter what (understatement much? This visit was life changing), but participating in this event with the Yosemite Conservancy made the experience so much better. As part of the 52 Hike Challenge Adventure Series I am to complete contemplative hikes at the beginning, middle and end of the year. It’s a little early, but I may use this hike as my midpoint, because I sure did a lot of thinking about the last 10 hikes. My Yosemite experience was overwhelming and I had a hard time processing everything around me. I was traveling solo and my entire first day in the park I was screaming inside my head, “HOW DOES THIS PLACE EXIST?!? !” I spent a lot of time on hike 10 thinking about just how different I am from hike 1. If I’m honest, I probably wouldn’t have even taken this transformative trip without the challenge. Yes, I was hiking some, but joining this challenge and especially the Adventure Series has led me to take spending time exploring our natural environment much more seriously. I’ve found myself becoming more curious about my environment where ever I am, as well as feeling the pull to go deeper into nature. I have started taking my diet and exercise more seriously in order to become more trail-fit. Unfortunately I’m not going to get mountain-climber-fit by taking a moderate 5 mile hike once a week and eating junk (wah). I also experienced a deep and emotionally moving connection to John Muir and his writings and studies on this hike. I have never felt so moved and so able to understand and relate to another’s writing before. One of my big take aways and goals from this hike is to dive deeper into his studies, books and letters. If you’re not familiar with his work, I encourage you to check out some of his quotes. If you are familiar with his writings I would love for you to leave me a comment with your favorite Muir quote! I’ll leave you with one of my favorites below. I climbed El Cap back in the 90’s (before I got married). We sleep out in the open and enjoyed a few days away from it all. But we were really right in the center of one of the most beautiful places on the planet. Excellent post, thanks for taking me back, way back it seemed! I can’t imagine sleeping on the edge on the way up! Must be a thrilling experience all around. Watching these guys climb was completely mind-boggling to me. It’s so far up! Very cool you got to do that.